We begin a new series about home ownership, sharing true stories of people who have gone through the process of buying a property in Italy to give readers an idea of what to expect - because 'la dolce vita' in real life can be much more different than the fantasy suggests, and being prepared will go a long way in helping you deal with all that comes with buying a house abroad. Today, we speak to Stefania and Roger, who bought and restored a historic villa in Tuscany and transformed it into a B&B. When British-Italian couple Stefania and Roger saw Villa San Michele, a 17th-century farmhouse in Tuscany’s Val d’Elsa, it was – almost – love at first sight. 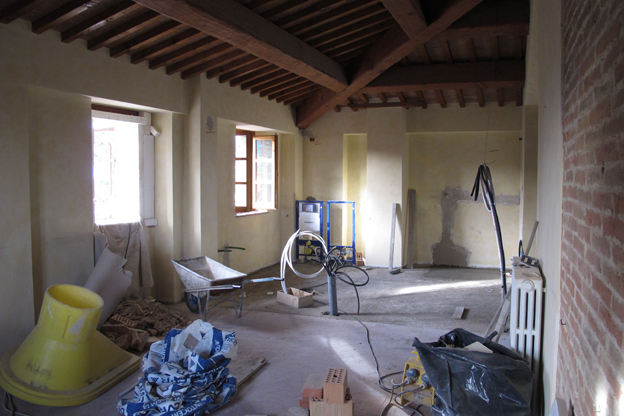 Roger, a Brit, could visualize the finished project – turning the villa into a bed and breakfast; Stefania saw the beauty and the potential, but, being Italian, she mainly saw ‘bureaucracy’. They had come prepared: they had spent months researching and inspecting properties, and were armed with a business plan and a checklist of all the requirements the property should have. 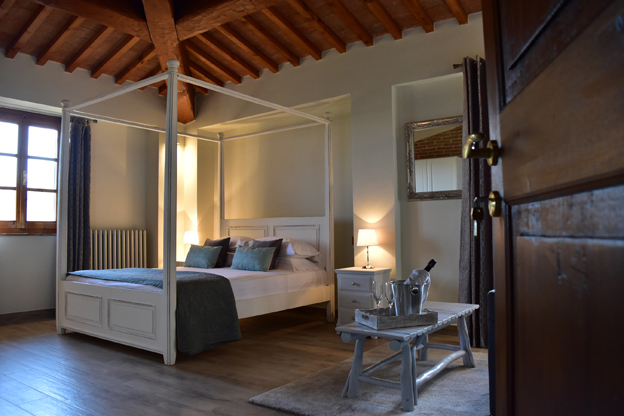 It was precisely their thorough preparation that allowed them to get through the demanding months of renovation work, dealing with suppliers and administrative offices, overcoming the mishaps, despite never having dealt with buying a property in Italy. And that’s the main tip they would give to someone deciding to embark on a similar enterprise: be prepared. 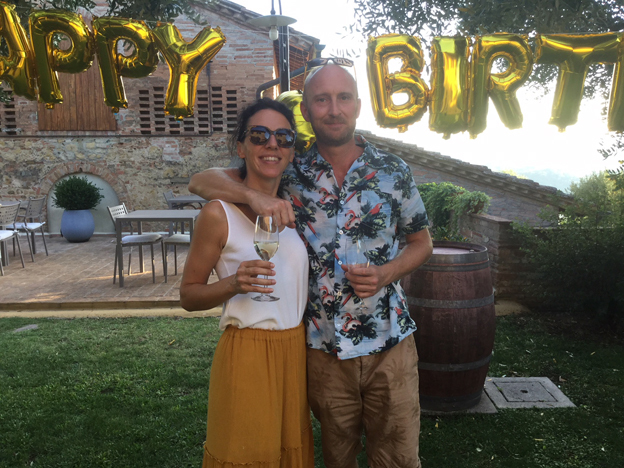 Stefania and Roger now happily run Villa San Michele, their five-room bed and breakfast overlooking the Val d’Elsa and San Gimignano, welcoming guests from around the world. We’ve spoken to Stefania to ask her to recount the experience for us and share some tips. Stefania, why did you and Roger decide to embark on this experience and what did you do before running the B&B? Both Roger and I worked in Corporate Security for a multinational for several years. Then we decided we wanted a change; not because we were dissatisfied with our jobs, but rather, because we wanted to challenge ourselves. We’d long had this idea of having a business together that would allow us to interact with people, and that’s why we chose the B&B activity. We love traveling and, while we no longer travel as much as before, I always say that we keep traveling through our guests, who come from all over the world, and inspire us to see places where we’ve never been. Why did you choose Tuscany for your B&B activity? 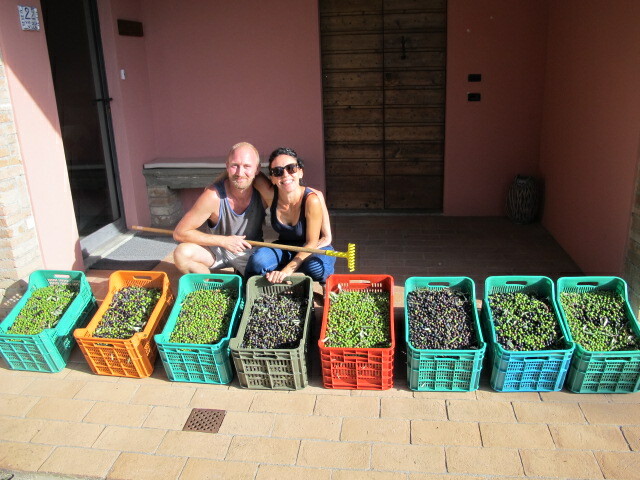 We chose Tuscany because we wanted to be sure to be able to work for the great majority of the year. There are parts of Italy where tourism is seasonal, whereas here in Tuscany we’re able to work at full capacity from March to November at least, and that’s important to us because our B&B is where we get all our income from. How did you get started looking for a property? First of all we decided on the location, which for us was either the Val d’Elsa or the Val d’Orcia, and we paid a few visits to the area, also in the winter months, when things are quieter. We suggest prospective buyers to do the same, spend some time in their chosen area, using local services (transport, supermarkets, shops etc.). We first started looking at property ads online and then contacted a few local estate agents, but at that point we had already prepared our checklist of requirements, so we knew exactly what we wanted. Because we were still living in the U.K. when we started, we sent the check-list to the real estate agencies so that agents would only offer properties meeting our requirements. 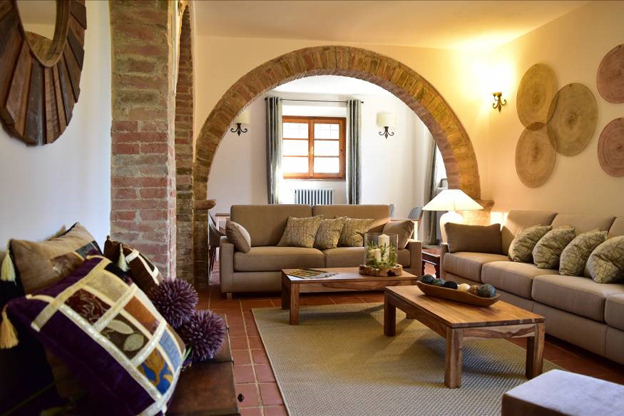 We were very strict on this: we would travel to Tuscany specifically to view properties, so we could not afford to waste time looking at properties that weren’t in line with our requirements. When you inspect a property, always take lots of photos and notes. What were the main difficulties during the purchasing phase? Always verify that what you buy corresponds to what is registered in the Land Registry. In Tuscany (and not only in Tuscany), there are many properties, or parts of them, that are ‘abusive’, meaning they’re not registered in the Real Estate Registry or are registered for a different use. In some cases, this can be fixed, but in others it cannot, and there may be financial sanctions, and even penal ones. We felt a little lonely in dealing with this, and because estate agents tend to be wanting to close the deal quickly, they can be evasive on this point. We visited several real estate registry offices ourselves. Our rule was always that if there was something illegal about the property, it must be fixed by the seller before the sale. If the prospective buyer doesn’t speak Italian, then it would be wise to hire a trusted consultant during this phase. What were the main difficulties during the renovation process? One thing we definitely recommend during this phase is to be present as much as possible, so that you can both have greater control over what the renovation workers are doing and to make sure they don’t go over budget – as we say in Italy, ‘fidarsi è bene, non fidarsi è meglio’ (to trust is good, not to trust is better). Another difficulty I’ve had is that, in Tuscany, it’s still very much a ‘macho world’, so workers and suppliers, who are mostly men in this business, didn’t like that they had to take orders from a woman, and even worse, a woman from Milan, not from the area. And because Roger didn’t speak much Italian, I had to be the one to get angry with them if something hadn’t been done the way we had requested. Always remember, if you’ve paid for a service, that service must be provided, and must be provided flawlessly. When the work is completed and the invoices have been paid, everyone’s gone and you’re not going to see them again if a problem comes up, so stand your ground. Have you made many friends since you’ve moved to Tuscany? Not many, as our priority has been getting our business up and running and all our time in the past 2 years has been devoted to this. Most of our friends are foreigners who’ve lived in the area for many years. Tuscans are a little guarded, especially when they don’t know you. Vico d’Elsa, where our property is located, has 400 residents, and it was difficult at first to fit in. At first with our neighbor, a hard working older lady, there was a bit of friction but now there is a regular trade going on over the fence: home made cakes (from us) in exchange of fresh vegetables and eggs from her vegetable patch. What would your number one tip be for someone interested in doing something similar? Do your homework. Research and study, there are now many resources online that can help in the preparation stage. Make a business plan, set your timing and budget. Never lose sight of your final goal. Also, follow your heart, but don’t forget to use your head. It’s easy to fall in love with Tuscany or with other parts of Italy, but make sure you ponder the idea of moving. You have to see yourself in the area even when the sunflowers are not in bloom and the weather is gloomy and the area deserted. Consider if the area is well served too. For me, it was also important that it was the two of us doing this together, because when things got especially difficult, we had each other’s support. Finally, be brave. Whilst researching the area and our competition, we were single minded in that we wanted to create a much more modern option for guests within a certain budget. There really weren’t too many similar properties offering what we were trying to achieve. Added to this, we made an early decision to only allow children over 14 to stay with us. The truth is the risk turned out to be one of our greatest achievements as we have found that most of our guests are like minded to us and they also enjoy the peace and quiet without the kids! Don’t be discouraged by the obstacles: the day when all the workers were gone and we saw the results of so many months of work was one of the best days of our lives. Thank you, Stefania and Roger, for sharing your story. If you want to learn more about Villa San Michele, or pay a visit to Stefania and Roger, check the website http://www.villasanmichelebnb.com. Photos courtesy of Villa San Michele.